In 2014, the average American Facebook user Liked 70 different pages. Over 30 million small businesses now have active pages on Facebook and 67% of the world’s biggest brands are on Instagram. As a result, many businesses are finding it more and more difficult to stand out and use social media to great effect. This is where a social media contest comes into the picture. Let’s dig in and find out the 10 ingredients to a successful social media contest. The first thing you need to decide is where you want to run your contest. Do you want to use Facebook to try and expand the reach of your brand? Or is Instagram a better fit for your visually-inclined fans? The contest world has kept up with the growth of social media (and social media platforms) over the past few years so the question of which platform to use is entirely in your hands. Facebook has the highest possible reach of the platforms based purely on number of active users, and is a great option for growing your fan base. Our favorite advantage to a Facebook contest is that it can easily be promoted with Facebook Ads, and Facebook Ads are truly awesome. They allow you to specifically target who you want to see your ad based on demographics, users’ interests, other pages they have liked on Facebook and places they have been tagged. They are the best way to get your contest seen by new pairs of eyes. Twitter is an easy platform for you and your entrants to share your contest with their community. Many Twitter contests have autofollow and autotweet options, meaning that when someone enters your contest they automatically follow you (similar to the old Like-gates of Facebook) and Tweet about your contest to their own followers. This allows your brand to gain more fans on the platform and to reach others’ networks. Twitter also gives you the option of using promoted Tweets to spread the word about your contest. A promoted Tweet looks very similar to an ordinary Tweet, but is purchased by businesses to advertise their content and reach a wider group of users who haven’t yet Followed them. Similar to a Facebook Ad, promoted Tweets expand the awareness of your contest and brand. An Instagram contest engages your audience visually, creating an emotional connection between consumers and your brand. With 300 million monthly active users, Instagram isn’t a platform to ignore. Instagram is arguably the simplest social platform, but also the most personal and intimate. You can display your products or services and give followers a look behind the scenes, making your business appear more welcoming. If you’re a business that relies on visuals (such as a clothing brand, travel agency, or restaurant) or operate in an industry like photography or adventure, an Instagram contest is a great option. An example of an Instagram contest can be seen below from Jorg Gray. 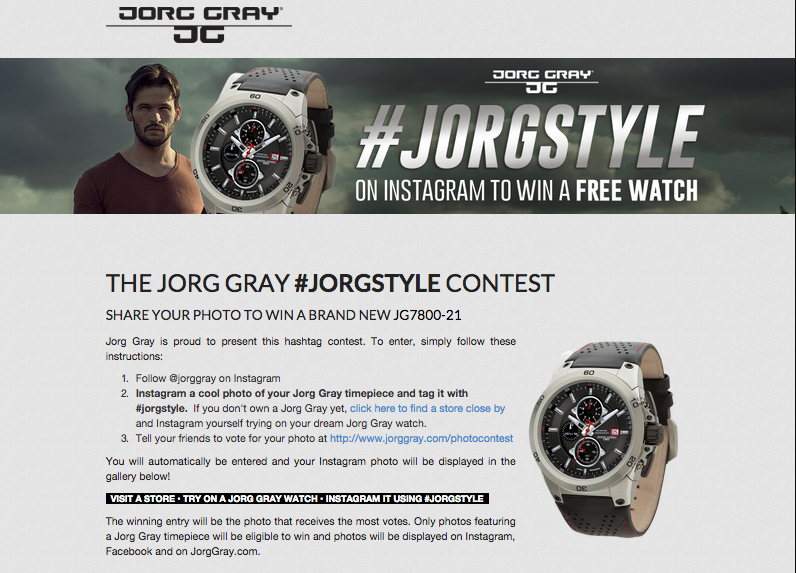 It involves users taking a picture with a Jorg Gray watch, following the brand on Instagram and hashtagging #jorgstyle to win a free watch. Choosing the right type of contest is crucial if you’re looking to gain interaction and engagement from fans and expand your awareness. You need to ensure that your contest type fits with your audience and their existing engagement level or knowledge of your brand. Sweepstakes/Giveaway: This type of contest requires little effort from entrants, builds your fan and follower base easily, and provides you with new email leads. The best contest type for beginners. Photo Contest: A photo contest requires medium effort from entrants but provides you with the email and social information of entrants as well as user-generated content which you can use for marketing purposes in the future. Photo contests are a fun way to engage current and potential customers and get them interacting with the brand. Vote Contest: A vote contest requires medium effort from entrants, as they need to submit a photo or idea and get it voted on by individuals from their own networks. If they want their submission to win they need to let all of their friends and family know that they have to vote. This increases the awareness of your contest and brand to non-Fans who were previously unaware of both. Referral Contest: A referral contest requires a low-medium level of effort from entrants. It helps you to grow your reach as existing Fans sign up to win a reward but can only enter once they have referred a certain number of other individuals to enter. This expands the reach of your contest as Fans are incentivized to share with their own networks. In addition to these contests, there are also essay and video contests (which require more effort from entrants), as well as Instagram Hashtag, all of which are awesome ways to engage and increase your fan base. Whatever form of contest you decide on and platform you choose to use, your prize needs to entice and motivate people to enter. You need a prize that is relevant, valuable and useful to your target audience. Your prize needs to be proportionate to the type of contest you choose to run. For example, if you’re asking leads to fill out a form and submit an essay, you better be giving away more than a $25 dollar gift card (which would better suit a sweepstakes or vote contest). Your prize needs to be worth more to your possible participant than the amount of time or energy you’re asking them to expend to enter. Your prize also needs to be relevant to your business. While buckets of cash or a cool new gadget are great incentives to get tons of leads, they’re not the types of prizes that encourage future purchasing. In some situations, volume may be all you want. But if you want quality leads for your business your contest prize needs to be tied to your brand. We recommend giving away a product or service of your business or a gift card. This gets customers engaging with your business and helps convert them into actual paying customers down the line. The prize can also set the theme for the contest. For example, if you’re in the travel industry and offer a free trip, the contest may be a photo contest of your favorite vacation memory. Working backwards from the prize may give you contest inspiration! For a contest to be successful it needs to be visually appealing. I know it may sound petty, but appearance does matter. You’re going to need cover and profile images for your social platforms (as seen below), a contest landing page, ad and social post images as well as emails with material relating to the contest. That’s a lot of graphic design. Ensure your designer has a list of everything you need from the beginning so that you aren’t springing additional tasks on them during the campaign. Remember that some of the content can be recycled or used for different purposes with different dimensions or small alterations. If you’re thinking that once you hit “launch contest” that you can sit back, throw your feet up on your desk and watch the submissions roll in, I’m going to have to wake you up to face reality. People don’t just magically find out about your contest. That’s not how it works. Yes, social sharing can give you a way to reach your fans and tell them about your contest, but that’s not nearly enough promotion. Any strategy that you can think of for promoting your contest to potential and current fans is one you should be doing. 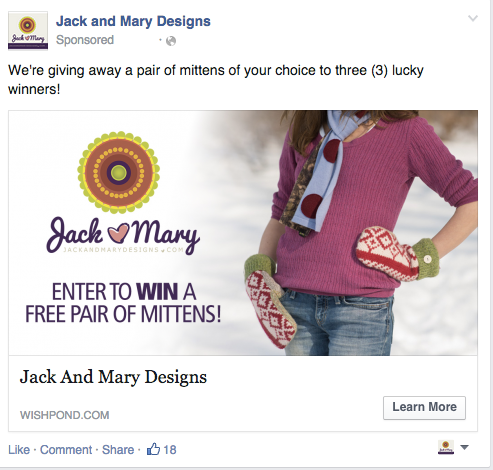 Under-promoting contests is one of the biggest mistakes we see clients make all the time. Be sure that you dedicate yourself to promoting your contest as the results will show in your entry volume and quality. How do your participants actually enter your contest? This is largely dependent on the type of contest you have chosen, but could range from a full form of personal information, to a simple email field to Liking a photo on Instagram. You need to consider the goals of your campaign. If it’s to gain more information from existing leads then ask away (so long as you’ve balanced your offer with your ask). If it’s simply to build your fan base, you’re going to want to limit those entry fields to get as many submissions as possible. Remember that the more information you ask for and the more hoops entrants have to jump through, the fewer will actually complete their entry. The more you ask participants to do, the more people will fall by the wayside. That said, you may find that asking for more information will result in more real-world sales down the line, as you can communicate more personally with an individual you know more about. Without specific dates mapped out for different launches and milestones throughout your campaign, you’re going to be in a flustered contest mess. Start by deciding what your contest end date is and work backwards from there. This will give you a good idea of when to launch the contest (based on how long you want it to be live) and when you should start promotion of the contest. 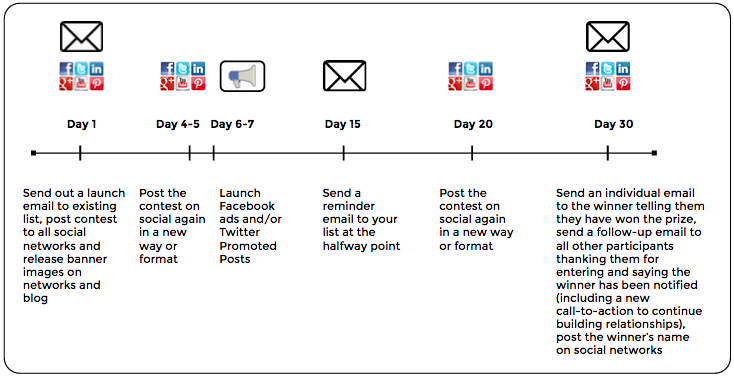 It’s important that you figure out what day your ad campaigns will start and end, when emails will be sent to your existing list about the contest, and what day you will announce the winners on your different social networks. If you’re looking to collect any type of data from your contest, a third party contest app is going to be a main ingredient. Third party contest software providers give you the ability to easily create and design the best contest for your business’ needs. They give you built-in voting and sharing options and the ability to easily moderate and track contest submissions. A good third party app also lets you collect info about existing fans and holds them in an exportable CRM, meaning you can actually use your contest to generate a real-world return. Unfortunately thanks to a little thing called “the law” you need to have specific rules, regulations and fine print within your contest. With each country and each social platform comes a new set of laws to follow, so be sure to do your homework and give your legal team everything they need to know to write up your legal terms. It may not be one of the tastier ingredients but no contest can run successfully without proper rules and regulations. If the fine print intimidates you, one of our customer success leads would be happy to talk it out with you. 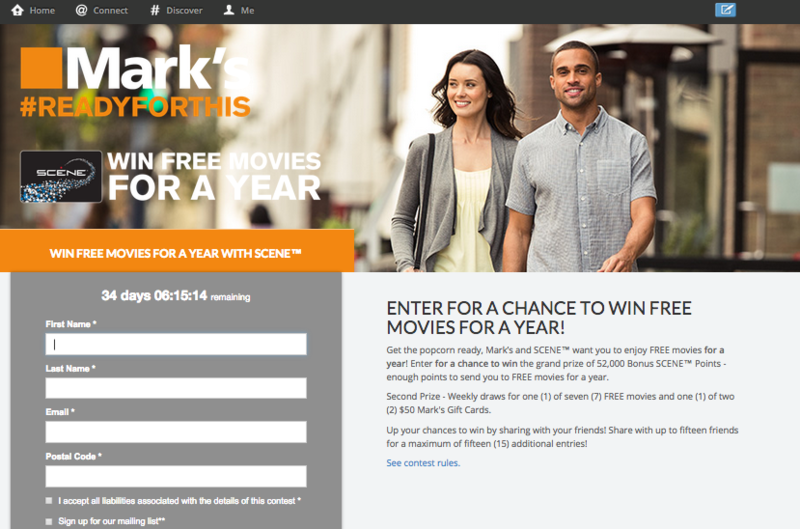 Once you choose the contest winner, it’s time to start building a relationship with your entrants. You heard me. The start of your contest is just the beginning. Post about the success of the contest and the name of the winner across your different social networks. This informs all registrants that the contest is over but also gives the winning individual the chance to have their moment in the spotlight. Use an email autoresponder to send out a triggered email to all registrants the day after the contest is officially over. In this email you want to thank everyone for participating but also encourage them to take another action to keep the relationship going. In the email include a coupon or discount code with a time limit (for ecommerce businesses) or send them to a webinar, video, ebook or additional part of your website. The goal is to send them to something they have not seen before to increase the value of your relationship and build their connection to your brand. The more they engage with your business, the more involved they will be in the future, and the greater the chance of them becoming a loyal, paying customer. If you work in an industry where a single lead is worth a lot of money to your business, you could even send out individual emails to nurture those leads into sales. An example of this would be in the real estate marketing field. If the participant has taken the time to enter your contest, chances are they’re interested in hearing what you have to say and may be interested in your services down the road. No, I’m not trying to sugar coat the end of this list for you. I know it sounds a little flowery, but commitment to a contest is actually the most important ingredient if you want to find success. Once your contest has launched you need to spend time every day ensuring it is running according to plan, monitoring new submissions and making alterations when necessary. A successful contest requires constant maintenance as things can change at a moment’s notice. Giving your contest a half-assed effort will result in nothing compared to what you could reach through dedication and devotion. Remember that you can never under-commit to a contest. Give it your full heart and full attention and you’ll be rewarded with strong leads and an engaged fan base. Do you have any other crucial ingredients for a successful contest based on past experiences? I would love to hear them! Feel free to drop me a line in the comments section below.